Lest we forget, the country where I currently reside would like to get rid of free school lunches. This is because old white men would rather use government funds for bombs and stuff instead of feeding poor kids--usually poor kids of color, but not exclusively. I say this not as a political or as a partisan statement, but as one human watching other so-called humans take steps to actively harm children who, through no fault of their own, don't have enough to eat. I encounter this mentality on a very small scale when I am at work and a child has overdue books. More often than I'd like, the parent scolds the child for not bringing the books back on time, and sometimes even forbids them from using the library. I would often like to point out that little Elias or Aeryn cannot, in fact, drive a car, because they're six. Ergo, they cannot bring materials back and that's your job as the parent. But I get that parenting is hard, too. That's one of the reasons I've not become one yet--I'm terrified of screwing up and I am a selfish lady who needs to get her own stuff together in life before I start trying to help a miniature human do the same. However, no matter what's going on with a child or a teen's parents, that young person should never be made to pay by going hungry. Denying them sustenance is certainly not going to improve moral fortitude or whatever opponents of free school lunches think. I mean, in this country, kids don't even get a decent free lunch. Milk carton, rubbery food that's made out of other food bits, no fresh fruit or veggies--we're already shortchanging these kids. And then people sit back and gloat and say, "Look at The Poors. They are so unhealthy. Thankfully, I am rich and can afford to clothe my body in Lululemon while smothering organic avocado masks on my face and imbibing kombucha. But I'm not paying for a poor child to have a meal. They should get a job." Most of the time, humanity is a real bust. Gem and Dixie are white and pretty. Dixie, especially, is popular in her grade. No one would guess that there's never any food in the house, and no money with which to buy it. Their mom is either spending it on booze or drugs or both. And Dad? Mom kicked him out a long time ago after his womanizing got to be too much. Now he's an almost-mythical figure to younger sister Dixie, who reveres him. Gem knows that he's no good, but she still craves his approbation. One day, Dixie gets a letter from her dad. He's coming back to Seattle--but this has to be a secret from Mom. Of course, Mom wheedles it out of Dixie, setting off a fit of apoplexy. But Dad rolls into town smooth as you please, pulling his daughters out of school early and taking them grocery shopping. Gem knows that this is too good to be true. So when Mom gives Dad the boot (again) and throws all of the food down the garbage chute, Gem has to do something. But what? She doesn't have any money or any friends. Oh--but what's this weird bag under the bed? Full of money? Dad must have stashed it there--and if it's Dad's, it's definitely not on the up-and-up. But Gem knows it's her ticket out, and after all, doesn't he owe her that much? Dixie, however, insists on accompanying her sister on their flight to downtown Seattle, a place they'd never been. Dixie's savoir faire gets them into a posh hotel, where they gorge themselves on room service. But what next? The money will only last so long, and Dixie doesn't really want to leave everything. But Gem's entire life has been about protecting her little sister. Is she brave enough to let her go? The nuances of Gem's character are astounding. She's had to be the mom and the dad and the older sister in her family for so long that she's burned out. No child should have to be an adult at eight years old, or six years old, but Gem did it to keep herself and her little sister alive. And it's exhausting. Why can't life get any easier? Why doesn't Mom see that they're hungry and dirty and haven't had new underwear in years and that that's not okay? Why does Gem always have to be the practical one? Is it so wrong for her to want to leave all of the responsibility she's assumed and just walk away? 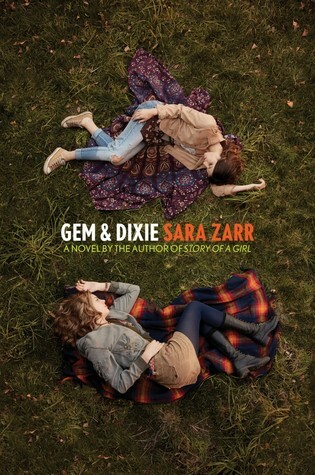 Gem & Dixie is all about the characters and their struggles, so the actual plot recedes into the background. This is not a problem book about Runaway Teens, but about teens who are constantly running away from what they fear most. The intricate knot of hunger and poverty and shame and lies sits at the core of Gem's being, and Zarr treats her characters with humanity and respect. My only complaint would be that the end of the novel wraps up too quickly, and I didn't quite understand why everything that happened, happened. However, this is an excellent novel on a very current, urgent, and necessary topic, and should be in all teen collections. Guess what? We don't, alas, have free school lunches here. Not even the free milk I remember from my childhood. My school does have a breakfast program, twice a week, with some funding we get from a welfare organisation, and the welfare teacher gets fruit, vegetables and groceries from Second Byte for those kids who have nothing at home. But no government program. And when kids turn up without lunch, they can get a muesli bar or crackers and cheese from the welfare teacher, but that's not really lunch. I sometimes reach into my own pocket to make sure some child does get something - or share my own lunch if they see me soon enough. Really? I always thought this was a uniquely American failing. When I was working with my teens, they'd come in and not have had anything to eat all day, so I would try to have snacks on hand, but it's not the same as a meal. Would you say that the general opinion of free school lunches has to do with an overall opinion of work ethic? Many older people here still firmly believe that meritocracy is the end-all-be-all, and that the sins of the father/mother should be visited upon the children. It's awful. My aunt is a teacher, and one of her coworkers had a student steal her lunch and then accuse the teacher of having stolen it from the student. This is where we are. Wow, what a strong beginning to your review. I was on free lunches once too :/ I'm from Europe though. I'm actually quite interested in this book now.